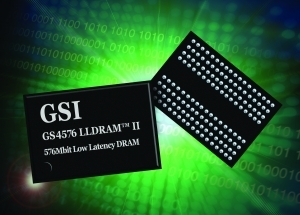 ACAL Technology is sampling GSI Technology’s new 576Mbit Low Latency DRAMs (LLDRAM II) for immediate evaluation. The GS4576 family provides second-source, drop-in replacements for existing low latency DRAMs in 16M x 36, 32M x 18 and 64M x 9 organisations in 144-ball μBGA packages. The GSI LLDRAM II range offers clock speeds of up to 533 MHz, allowing it to produce data at over 38Gbits per second on a 36 bit wide data bus. All versions are offered in both commercial and industrial temperature ranges. The series also offers configurable read/write latencies and cycle times, as well as configurable burst lengths, in addition to a traditional multiplexed address bus option to provide backward compatibility.